Trends in lighting change. When you assess a space to update it, changing the lighting fixtures can have a huge impact but is often overlooked. In today’s kitchens for example, we’ve gotten away from the old fluorescent rectangles and are trending toward pendants that hang down over an island or work area. Under-the-counter lighting is another option. Another lighting trend is to put a chandelier in a bathroom, particularly in a master bath. This adds a touch of elegance and whimsy and makes the bathroom a little more intriguing. Occasionally there’s use for colored lighting but mainly for ambience. Use an uplight behind a plant, change the color according to the seasons, or bring attention to a particular color. You can also add room color with candles. In most cases, individuals use a combination of two or three types of lighting. This creates the most flexibility for the use of the space, and dimmer switches allow the level of light to be easily adjusted. Design tip: The type of bulbs you use matter and have an impact. The trend is toward bulbs that have longer life and also provide a truer, whiter light. Even in fluorescents, there are bulbs that replicate daylight. They are a little more expensive, but use them wherever possible because they give a more natural light, which is more invigorating, causes less stress on the eyes, and makes people look better. Stay tuned in our next post where we discuss lightening from four different perspectives. To learn more about the critical design elements or for a free lighting consultation, call 203-405-2126 today or pick up a copy of “The Styleprint Design System” available for purchase here. Also, be sure to explore our site,www.styleprintdesignsystem.com for additional free resources. Ready to give color a try? Our professional decorators work with you to uncover your distinct style with our Styleprint™ Design System. When we design a room for you we bring samples of upholstery, wallpaper, rugs, and paint for you to touch and feel. When our clients find their color confidence, they are pleasantly surprised by their selections and are thrilled with the results! To find your local DecorDesigner, simply click here. The holistic view of Wow! Home décor. 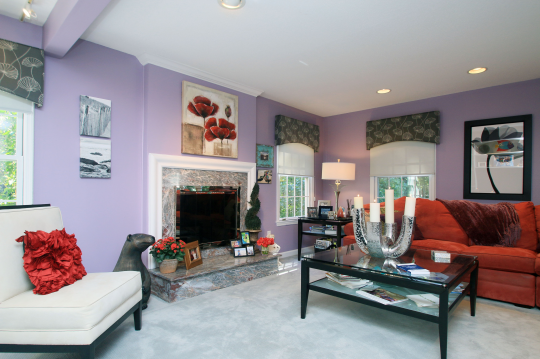 Today in the Southbury, Connecticut area it’s not only the aesthetic look of your interior spaces- colors, textures and accessories that help deliver a Wow! Look, but also the ability of your home to support your feelings, emotional health and future dreams; delivering a true holistic sense of who you and the other occupants are, and who you are in the process of becoming. 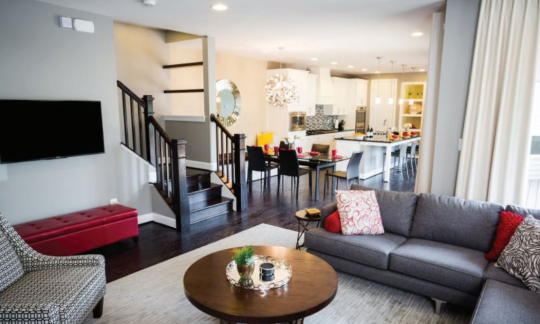 No more simply choosing some colors and a few furnishings from your local retailer and calling it “the design plan”, a holistic home incorporates style, personality, sustainable furnishings, all of which need to roll up into a fashion sense that identifies you as an individual on the move. Maybe not in the sense of physically moving- but certainly in a sense of emerging into the person or family you want to be. You might think, décor can do all that? Yes, and more. The right space, beginning with sourcing individual elements that honor the environment, your personal ethics and ones that encompass your unique talents can help heal a heart, solidify a relationship and offer a platform for a strong family unit. Identify your physical and emotional comfort triggers. Is it a cozy space in front of a window, or a cubby tucked into your family room? Do you love natural light or many candles casting a soft glow? Select some elements that appeal to you. A good place to start is in your clothes closet. What five outfits do you reach for time and time again? Think about why, and include those elements in your design plan. What are you conscious purchases and what do you stand for on this planet. Ooh, that’s deep. Maybe you use recycled paper towels and turn your lights off when not in a room, or you sit on the board of your local environmental charity, are a vegan and make your own soap! Whatever level you commit to – you are participating in sustainability in one way. Leverage that in your home design, too. Taking some time to look inward to who you are and who you and your family are becoming is a great start in creating a Wow! holistic look that will serve you well. 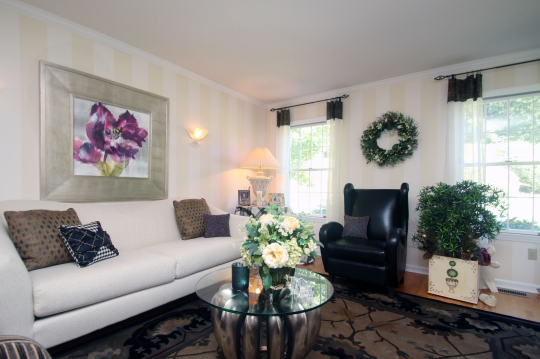 Call Decor&You today for a free design consultation 203-405-2126. Your bathroom serves many functions. Many important functions. But modern bathroom trends are upping the ante for a combination of purpose and beauty that is beyond simple utility. Your days of bathing, relaxation and pampering will be full of elegance and style that reflect a comfortable boudoir or inviting living room over a stark bathroom. Spacious bathrooms are in style. If you are remodeling and can open up this area, do it. Otherwise there are some techniques you can implement to make your bathroom appear more airy and welcoming. Many designers believe this spacious approach to design promotes both health and mood improvements. Start by embracing white as a way to reflect light throughout the room. Think white walls, white rugs and white accessories. Then, learn to love mirrors and glass. They both reflect light instead of absorbing it. Multiple mirrors in unexpected places such as near the floor help to expand the room. You could even consider a full wall mirror to instantly double the visual space. Installing glass shower, closet and vanity doors will also add to the feeling of openness. For functional accessories, turn to Lucite. This material helps create a simple, uncluttered look achievable with opaque décor. If you are faced with a bathroom without windows, create the illusion of one. 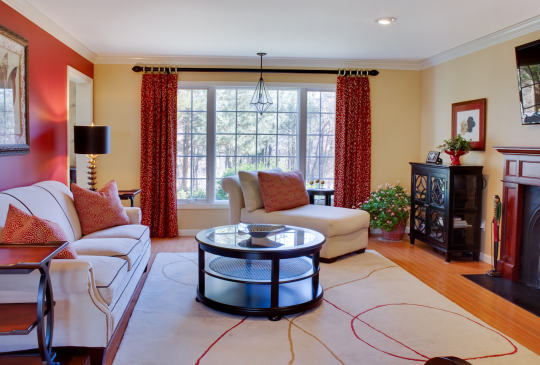 First, add window treatment elements such as curtains and blinds. And yes, I’m referring to hanging them on your empty wall. Since blinds are normally drawn in a bathroom anyways, you don’t have to worry about the view. 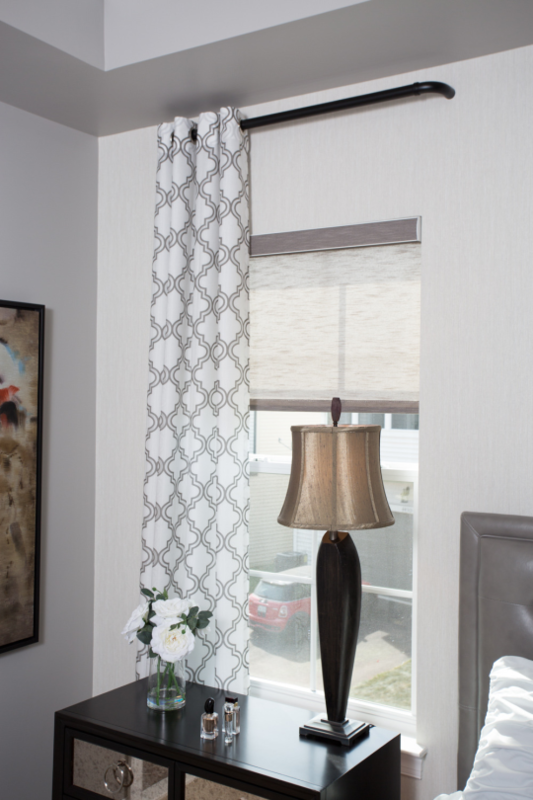 Complete the faux window with a soft light behind the window treatments for a subtle glow. Another aspect to consider when dealing with limited or no windows, is the lack of horizontal light normally provided. Install wall fixtures to break up the overhead light that shines vertically straight down. You will create a much more flattering appearance and ambiance. Furniture elements create the perfect blend of at-ease luxury. Think elegant chairs and impressive rugs that create a chic style likely to be found in an upscale bedroom. A leather ottoman – it will make its best statement in white. A comfy accent chair – a spacious bathroom needs a more voluptuous chair. Include a foot rest and consider making it stand out with a pleasant accent color or unique embellishments. One-of-a-kind style works well here as you are not looking for a matching set. A sophisticated bench – look for a unique piece to add function and beauty. Try wood accents for any of the furniture pieces listed above. For example, wooden chair legs will add warmth and comfort to your bathroom. From impressive lighting to elegant fixtures, you don’t want to leave your bathroom “unfinished.” Give careful thought to every detail and accent as you are aiming to create a very personal interior. For instance, if you enjoy a water theme in the bathroom due to its calming qualities and symbolism of good health, let it shine through. Choose a color combination of blues and bring in subtle details that reflect continuous flow and movement. From a simple bench placed inside your shower to a deluxe shower-sauna combination, a modern bathroom’s spa elements are created with ultimate relaxation in mind. You do not have to have a large space to install a sauna. Many designers have converted closets and utilized shower space to create a sauna of the perfect size and shape. This is also the perfect opportunity to consider where a free-standing bath tub should reside. What to know before you decorate. Planning to decorate? Here’s the process that results in WOW! Décor! I know, you are thinking a WOW! space just happens, right? I’ll let you in on an industry secret- beautiful spaces are carefully planned, executed and delivered. You want a space that will immediately reflect who you are -naturally and effortlessly beautiful. WOW! When you are planning to decorate, the key to success is following a Plan to buy and buy to plan process. This process will reward you with fantastic décor. You Plan to buy by completing your planning your spaces upfront and you Buy to plan by purchasing items included in that plan overtime as your budget allows. Without this plan, you may make a mistake, which can come with a big price tag, not to mention lots of disappointment and frustration. I’m sure you can relate to seeing something amazing, a luscious area rug, an eye-catching piece of art or a yummy comforter and think it would work well in your space. But if the rug clashes with your sofa, the art is out of scale for your room, or comforter is too hot for your mate, it’s all wrong. This is why having the Plan to buy and buy process is so important. Floor plan. This includes a solid traffic flow plan, an idea of the size for every design element, which includes furniture and lighting. Without this, you are in big trouble. An investment plan. Having an idea of how much you have to invest in your space (and it is an investment- your home is often the biggest purchase you ever make) is crucial. Beautiful, functional and timeless design comes in all price points. And remember, you don’t have to do it all at once; you can purchase pieces over time as your budget allows. A design plan. Ooooh, did I say “design” and “plan” in one sentence. Yep. A design plan starts with the end in mind like Steven Covey in his book The 7 Habits of Highly Effective People. How will you use this room? a. As a kid hangout or adult retreat? b. Who will use this room? Elderly parents or your entire extended blended family? c. Why are you redecorating? What do you love in the room, what simply must go? d. What will the finished room feel like if it’s done well? A WOW! ROOM is obtainable and you deserve to have more than one. Using these tips will get you started on a space that you can truly love. Enjoy the process! Call us at 203-405-2126 at Decor&You location today to get started on you personalized decorating project. Most Washington DC homeowners have a few treasured family heirlooms they can’t bear to part with whether it’s a chair, piece of art, or an accessory. Would you be surprised to know that it is possible to incorporate them into a new decorating plan without compromising style? It has to be done creatively and carefully, but it can be done and it can look absolutely fabulous. 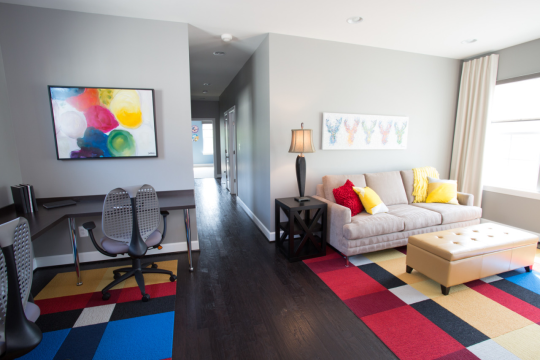 Here are your tips on how to work your existing furnishings and art into your decorating plan. Are you experiencing a decorating dilemma? we are here to help! Please contact us at 203-405-2126 today at Decor&You to set up a design consultation and let’s create a space together that you will love.